Last week, JetBlue published its 2017 Environmental, Social and Governance (ESG) Report which highlights all the work the airline has done to ensure JetBlue’s sustainability. Throughout the report, readers will see mentions of all the work JetBlue is doing to run a sustainable business. For any airline, this is mostly about conserving fuel. 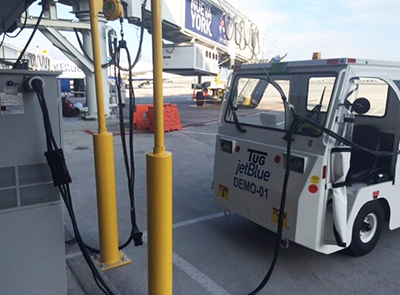 JetBlue has a lot to share…from introducing electric Ground Service Equipment at JFK to our recent order for the latest fuel-efficient engines…to equipping our aircraft in preparation for the latest advances in air traffic control…to providing support and funding for renewable jet fuels. The list is extensive and impressive – and it speaks to JetBlue’s culture of caring and our long history of innovation. JetBlue is always looking for new ways to contribute to sustainability and that’s where JetBlue Technology Ventures also comes in. With electric aircraft set to revolutionize regional travel, and new technology available to provide accurate weather updates so that we can avoid delays (and save fuel), there’s a whole world of opportunity out there, and JetBlue has a front row seat in Silicon Valley to take advantage of it. JetBlue’s investors want to see that the airline is planning for the future in a changing world. In the report, JetBlue talks about the various 'risks' it faces and what the airline is doing about them. As an example, JetBlue faces 'climate risk' as a result of climate change. Airlines may not be able to stop the risks from happening, but they can plan for them. JetBlue talks about the various risks it faces, from the increasingly severe weather...to rising fuel costs...to increasing sea levels impacting coastal airports. Then they show how we'll deal with the risks as and when they arise. The very active 2017 hurricane season was an example of how extreme weather events affect JetBlue. In this report, JetBlue discusses its response, including managing its operation and supporting the recovery of the region, including through the 100x35JetBlue initiative.JetBlue demonstrated that it could deal with near-term extreme weather events, proving to investors that the airline is well positioned to deal with the impacts of a changing climate. Check out the report to see JetBlue's unique approach shine through. Crewmembers across the airline are all playing an active part in running a sustainable airline now and preparing for the future in a changing world.